Marie Kondo, creator of the KonMari Method, and author of The Life- Changing Magic of Tidying Up has been fascinated with decluttering since the age of five years old. In those days, she organized her room, her parent’s rooms, her book bags, and anything else that seemed cluttered and out of sorts. This small seedling of an enchantment with joyous configurations has led Marie Kondo to become one of the world’s foremost authorities on decluttering the spaces we live and work in. Today, the KonMari method is an exhilarating system being used around the world. Marie Kondo has been asked to speak and give advice to companies like Google. However, her most indelible mark has been made with those clients she has taken on- and those people who have read her book and put its category specific strategies into place. Facebook has numerous KonMari Groups where those who are putting KM practices into use come together to talk about the ideas, the strategies, the obstacles and yes, the joy that comes with following Kondo’s life changing techniques. The KonMari method leads to a greener, leaner lifestyle because the obstacles that stand in our way of doing so are obliterated by the decluttering, organizational system of Marie Kondo. Here are five secrets in Marie Kondo’s own words that address those obstacles that experts and studies agree prevent individuals and businesses from going green. “All you need to do is take the time to sit down and examine each item you own, decide whether you want to keep or discard it, and then choose where to put what you keep.” -Marie Kondo. Experts agree that one of the main reasons going green and clean is so difficult for many is that they are too busy. The distractions of their lives prevent them from concentrating on environmental concerns. The KonMari Method helps declutter the home or the business and captures the concentration necessary to choose a greener, cleaner lifestyle. “The question of what you want to own is actually the question of how you want to live your life.” – Marie Kondo. In America, especially, we have been socialized as a consuming society. We have been brought up to believe that the more we own the more successful or privileged we are. This type of thinking leads to a cluttered life and a cluttered home and it does not lead to green living. The brainwashing we receive from a young age is hard to work through, but these specific questions from the KonMari Method help each person move toward clean and green. “Keep only those things that speak to your heart. Then take the plunge and discard all the rest. By doing this, you can reset your life and embark on a new lifestyle.” – Marie Kondo. Studies have shown that many people may want to use more green products and live a cleaner lifestyle, but they feel that their small actions will make no difference. What difference can it make if we take a cloth bag to the grocery or make recycling a part of our everyday lives? 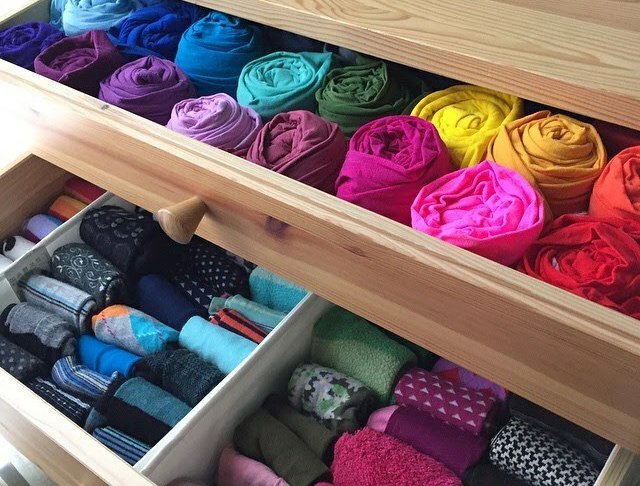 The KonMari Method helps to ‘reset’ your life and installing green changes become easier. Who knows, it might just catch on! “People cannot change their habits without first changing their way of thinking.” – Marie Kondo. There are many organizations and individuals who wish to go green, and want to live a cleaner, decluttered lifestyle, but they are overwhelmed by the enormity of the task. We look at the overload of information on climate change, water shortages, food contaminations, and animal extinctions and hurriedly look the other way. We can make a start in our own homes by changing our own mindsets. “Tidying is just a tool, not the final destination. The true goal should be to establish the lifestyle you want most once your house has been put in order.” – Marie Kondo. Nothing is harder than change. We all know this. It takes enormous outlays of time and energy to create a living space that brings joy. It also requires commitment to the specific type of lifestyle that each person chooses to live. These five secrets are the beginning of a journey that will bring each individual who travels it a new and refreshing change of heart. One day the person who has read about the KonMari Method will decide to implement the method in his or her home. They will begin to use a very simple question as they choose what to keep.